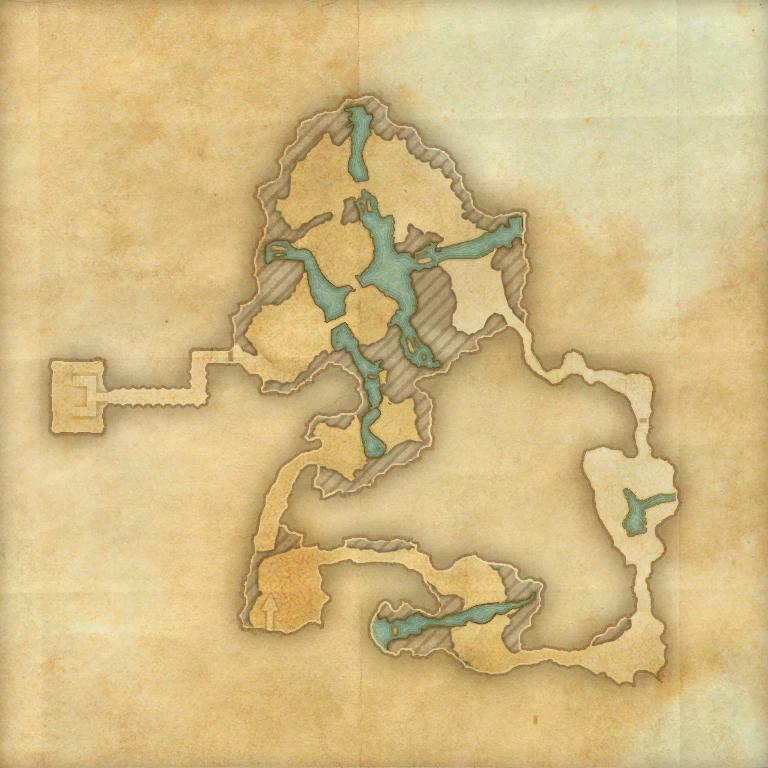 Fungal Grotto II is a group dungeon found in western Stonefalls. The storyline continues from the events of Fungal Grotto I. In this version, Defender Two-Blades needs you to defeat the Spider Cultists who have taken control of a dangerous artifact called the Obsidian Husk. The primary mechanic in this battle surrounds her three spider pets. Each spider, while alive, keeps her damage reduction at normal levels. If a spider is killed during the fight her damage reduction increases. If all three spiders are killed, Ciirenas becomes extremely resilient to all forms of attack. So as not to prolong the fight, it's advisable to keep the spiders alive as long as possible. The core mechanic of this fight is Gamyne's Shadow Execution ability which can occur multiple times during the battle. A member of the group will be targeted by four shadow warriors and pinned to the ground. An ethereal sword appears above the player's head and slowly descends. This attack cannot be avoided, and players cannot break free from it. To escape, the other members only need to kill one of the Shadow Tormentors in order to free the player. If the players fail to free the trapped group member in time, the sword will impale that player resulting in an instant death. Also of note is Gamyne's Chains of Misery ability. This magical blue beam tethers two players to each other and inflicts high magical damage over time. To break the beam, the two players must move away from each other until the beam breaks. 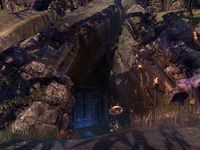 The most notable mechanic in this fight is the portal at the back of the arena which can ensnare the closest player to it and transport them to a shadowy cave full of spiders. 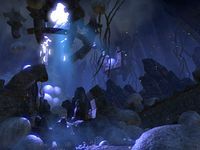 To escape the cave, the player much kill all the spiders after which they will be transported back to the arena. This mechanic can be avoided completely by keeping the Spawn of Mephala near the bridge well away from the portal location. The only notable mechanic with Reggr Dark-Dawn is his occasional Orb of Enervation ability. This ability will drain almost all points of magicka from the group. There are two primary mechanics in the final boss battle. Her Growing Corruption ability teleports her to three random players and drops dark pools of corruption where they stand. These pools of corruption grow in diameter and inflict high magical damage over time, thus they should be avoided at all costs. The second mechanic is her Shadow Conduit ability. Multiple beams of light target all players and deal high magical damage over time. For protection, players can run into the protective bubble around the nearby wayshrine. Fungal Grotto II Vanquisher 10 Defeat Mephala's Fang, Gamyne Bandu, Ciirenas the Shepherd, the Spawn of Mephala, Reggr Dark-Dawn, and Vila Theran in Fungal Grotto II. Fungal Grotto II Conqueror 10 Defeat Gamyne Bandu, the Spawn of Mephala, and Vila Theran in Veteran Fungal Grotto II. Fearless Assaulter 50 Defeat Vila Theran in Veteran Fungal Grotto II without any member of your party using the protection of the Obsidian Husk. Veteran Obsidian Slayer 10 Defeat 425 Obsidian Warriors in Veteran Fungal Grotto II. Fungal Grotto II Survivor 50 Defeat Mephala's Fang, Gamyne Bandu, Ciirenas the Sheperd, Spawn of Mephala, Reggr Dark-Dawn, and Vila Theran in Veteran Fungal Grotto II, without suffering a group member death. Fungal Grotto II Assassin 50 Defeat Mephala's Fang, Gamyne Bandu, Ciirenas the Sheperd, Spawn of Mephala, Reggr Dark-Dawn, and Vila Theran in Veteran Fungal Grotto II within twenty minutes of starting the dungeon. Timer starts when players engage the first group of Spider Cultists. This page was last modified on 4 October 2018, at 16:36.